The 1632 series, also known as the 1632-verse or Ring of Fire series, is an alternate history book series and sub-series created, primarily co-written, and coordinated by Eric Flint and published by Baen Books. The series is set in 17th-century Europe, in which the small fictional town of Grantville, West Virginia, in the year 2000 was sent to the past in central Germany in the year 1631, during the Thirty Years' War. 1632, the first novel in the series. As of 2015, the series has five published novels propelling the main plot and over ten published novels moving several subplots and threads forward. The series also includes fan-written, but professionally edited, collaborative material which are published in bi-monthly magazine titled The Grantville Gazettes and some collaborative short fictions. In terms of the history of Time Travel literature, the 1632 series can be considered an extension and modification of the basic idea dating back to Mark Twain's "A Connecticut Yankee in King Arthur's Court", in which a 19th-century American engineer, finding himself in 5th-century England, is able—all by himself—to introduce into the past society the full range of his time's technologies. In Flint's version, a whole modern community is transplanted into the past, in possession of a considerable amount of the material and written resources of modern society—making their success in changing the past more plausible. 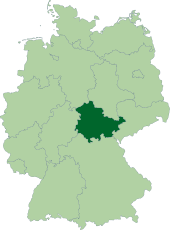 Map of today's Germany where the dark green shows Thuringia (compare with Holy Roman Empire map above). 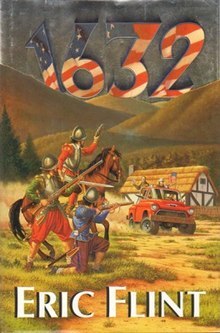 The 1632 series began with Flint's stand alone novel 1632 (released February 2000). It is, excepting the lead novel and the serialized e-novel The Anaconda Project (2007), virtually all collaboratively written, including some "main works" with multiple co-authors. However, Flint has mentioned contracts with the publisher for at least two additional solo novels he has in planning on his website. Flint, whose bibliography is dominated by collaborative work, claims that this approach encourages the cross-fertilization of ideas and styles, stimulating the creative process and preventing stale, formulaic works. As stated in the first Grantville Gazette and on his site, Flint's novel 1632 was an experiment wherein he explores the effect of transporting a mass of people through time. 1632 occurs in the midst of the Thirty Years' War (1618–1648). The plot situation allows pragmatic, American, union-oriented, political thought to grind against the authoritarian, religion-driven societies of an unconsolidated Holy Roman Empire barely out of the Middle Ages. Flint explores examples of suffering due to the petty politics of self-aggrandizement and self-interest on the one hand, and the irreconcilable differences of the schism in Christianity such as the Protestant Reformation and the Counter-Reformation on the other. Despite the fact that the shift puts Grantville in May 1631 initially, because of the ongoing war and the primitive transportation networks of the day Grantville's arrival has something of a delayed impact, so the bulk of the book's action takes place in 1632, hence the name. The series was initially continued with two collaborative works that were more or less written concurrently: 1633 (with best selling novelist David Weber) and an anthology called Ring of Fire (with other established science-fiction writers, including long, "deep background" stories by both Weber and Flint). Overall, the narratives are not oriented on one group of protagonists with a strong lead character, but instead are carried by an ensemble cast—though most books or short stories do have several strong characters who carry the action and plot forward. Flint had intended from the outset that the whole town would be the collective protagonist; a reflection of his philosophy that historic forces are not centered in the main on the actions of one or two key individuals, but on the many small independent actions of the many going about their daily lives and coping as best they can. By late in 1632, the New United States-led coalition of the Confederated Principalities of Europe had become the arsenal and financier (through Jewish connections of real historical interest) for Swedish King Gustavus Adolphus (the displaced Americans' intervention in history already had the effect of preventing Gustavus from being killed in the Battle of Lützen, as happened in the "original" history). This leads the scheming Cardinal Richelieu, who'd been previously financing him to spite and weaken the Habsburgs, to turn on the Swedes. Various books from up-time Grantville, especially history books, had found avid readers amongst Europe's ruling elites, changing the plans and strategies of major players of the time. The readers, not understanding the chaotic nature of events (i.e., trivial-seeming changes can have large effects, and vice versa), often believe that these histories give them a strong idea of how they can guide events in a different direction. The "players" sent back through time have no intention of strongly guiding events, but understand how key forces (democracy, sanitation, medicine, egalitarianism, etc.) affect things in the long run to the betterment of mankind, and intend to promote and spread those even if they themselves are not "in control" of what results. Richelieu forms a four-way alliance, the League of Ostend, to oppose the New United States, Gustavus' expeditionary army, and allied princes of the German states. After the first book, the series begins multiple plot lines or story threads reflecting this independence of action by a multitude of characters. The sequel 1633 spreads the Americans out geographically over Central Europe. Next, the novel 1634: The Galileo Affair, and the first of the anthologies called the Grantville Gazettes introduced new strong characters. The former begins what is called the South European thread, and some of the stories in the latter and Ring of Fire began the Eastern European thread (Austria-Hungary northwards to Poland). Co-author of 1633, New York Times best-selling author David Weber was contracted for no less than five books in the series in what is called the Central European thread or Main thread of the series, but there was a delay before the two authors synchronized their schedules to write that next mainline sequel, 1634: The Baltic War, released in May 2007. Without waiting for Weber, other sequels such as 1634: The Ram Rebellion, 1635: The Cannon Law, and the Grantville Gazettes continue in one thread or another with in-depth looks at societal ramifications from technology, religion, and social unrest as Europe deals with the outlandish ideas of Grantville's influential presence, to machinations of Europe's elites trying to maintain their hold on power, or leverage off of Grantville-triggered events or knowledge for reasons of self-interest. Grantville, West Virginia, in the year 2000, is transposed within an area of southern Thuringia of Germany in the 1630s. Grantvillers subsequently take on the Holy Roman Empire's troops in the Thirty Years' War, in order to maintain their own town's integrity. Grantville joins sides with Gustavus Adolphus, and tries to recreate the Germanies in the image of the United States. A diplomatic and trade mission to the Italies goes awry when youngsters attached to the mission decide to rescue Galileo from the Inquisition, and end up in a plot to assassinate the Pope. The plot is hatched by a French operative turned rebel, who wishes to destroy France to allow the rise of the Huguenots. Cardinal Borja, incensed with the behavior of Pope Urban, decides to assassinate the Pope and his political allies and to have himself declared the new Pope. Though Borja manages to take over the Vatican and establish quorum with cowed Cardinals, the old Pope escapes. Western Europe maneuvers to contain Gustavus Adolphus, resulting in a naval battle in the Baltic, and the conquest of Denmark by Sweden, and victory for Grantville's navy of ironclads. The Prince Cardinal Infante of Spain takes on vice-regal duties in the Spanish Netherlands, then decides to separate from Spain and declare himself King. With the aide of Grantvillers, he acquires a bride in the rebellious daughter of the Holy Roman Emperor, Duchess Anna Maria. The French Huguenot rebel plots to destroy Grantville, by assassinating the heads of Grantville. This leads to plots to oppose vaccination and destroy the Jews, as covers for assassination, which ends in the deaths of two of Grantville's leaders, and a violent purge of all anti-semitic forces in the area controlled by Grantville's allies. Sweden and USE invade Poland, Gustavus Adolphus is seriously injured, and the invasion comes to a halt. Episodes five and six of The Anaconda Project, an interrupted series in Grantville Gazette volumes 12–21, were incorporated into chapters four and five of 1635: The Eastern Front. Oxenstierna usurps the power of USE parliament, sides with the nobility, and forces the country into a civil war which is ultimately won by supporters of FoJP and CoC led by Mike Stearns. Bernie Zeppi takes a job as technical adviser to the Russians' attempt to bootstrap themselves into an industrial revolution. The Pope is pursued across Italian countryside by assassins sent by Borja, while the USE mounts commando raids to rescue Frank Stone and his wife from Spanish captivity. A semi-detective novel set in Magdeburg, from December 1635 to March 1636. Eddie Cantrell and Anne Cathrine marry and are sent by Admiral Simpson to Caribbean to secure access to the Jennings Oil Field. Naval battle ensues with the Spanish and settlers which ends in a standoff. The Barbie Consortium travel to Vienna as part of a plan to fix the Austro-Hungarian economy and defend its future. Meanwhile, the Ottomans, flush with victory, turn their gaze to Europe and their old enemy. Cromwell and the Americans flee north to Scotland in order to escape King James of England and his new Prime Minister the Earl of Cork. The USE's war with Poland enters a new stage while the invasion of Bavaria comes to a conclusion. Meanwhile, the Ottoman Empire comes ever closer to their long-sought goal of capturing Vienna. 1636: Mission to the Mughals April 2017 Eric Flint Griffin Barber 978-1476782140 Grantvillers sent to India to obtain saltpeter and opium from Shah Jahan of the Mughal Empire. A delegation from the USE is sent to the Mughal Empire in order to secure both trade deals and establish a new trade route. All the while, various elements in the royal court scheme to usurp Shah Jahan. Urban VIII pulls together a consistory as a mini-Vatican II and is then assassinated. Cardinal Bedmar is elected as the new Pope but Borja still occupies the Vatican. Results in an incredibly deep divide within Catholicism; Spain, Poland, Bavaria go for Borja in Rome, deep division within Austria. Czar Michael Romanov and his supporters flee beyond the Urals and establish their government in exile. The book details the trials and tribulations of establishing a new nation. 1637: The Polish Maelstrom April 2019 Eric Flint 978-1481483896 Sequel to 1636: The Ottoman Onslaught. The Ottomans continue with their invasion of Austria. At the same time, Saxony seized control of Lower Silesia, a region that has been in dispute with Poland for almost a century. Polish revolutionaries seized control of Galicia while Bohemia also became involved in that regional conflict. Includes (parts from) The Anaconda Project, an interrupted series in Grantville Gazette volumes 12–21. Several intertwining short stories combine to form a narrative that covers the overthrow of the ruling order by the common people, in a democracy drive, led by a political newspaper featuring a political cartoon starring a ram. Several intertwining short stories combine to form a narrative that covers the development subsequent to the Ram Rebellion in Franconia. 1635: Music and Murder September 2013 David Carrico 978-1625792143 Collection of stories previous published in the Gazettes and also Ring of Fire II & III; prequel to 1636: The Devil's Opera. Ring of Fire IV May 2016 Eric Flint 978-1476781242 Includes a short story by Hugo and Nebula awards winning author David Brin. 1636: The Chronicles of Dr. Gribbleflotz August 2016 Kerryn Offord & Rick Boatright 978-1476781600 Book is about a character that was first developed by Offord and Boatright and includes some material that was previous published in the electronic version of the Grantville Gazette plus additional new material. This novel deals with events in the timeline that the timeshifted Grantville left behind. Another novel that deals with events in the timeline that the timeshifted Grantville and a timeshifted Illinois state prison had left behind. 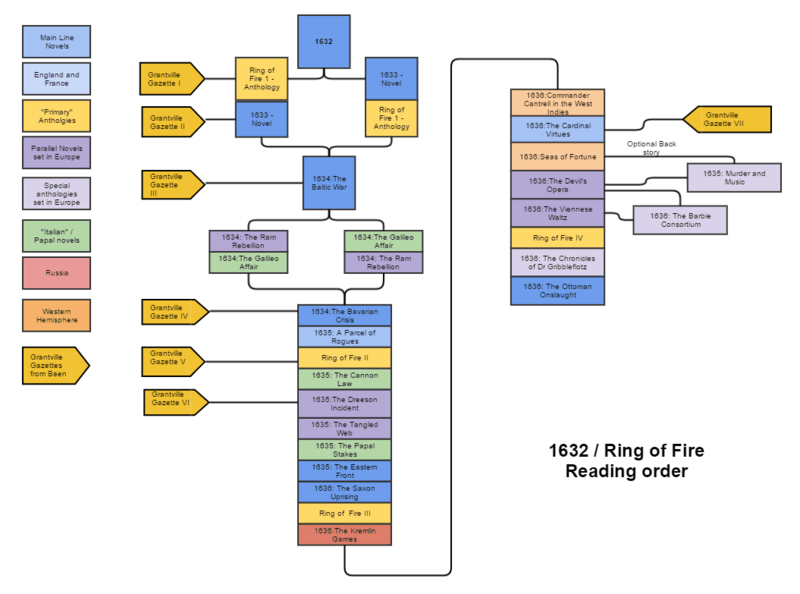 1632 plot threads refers to the overall story arcs or sequences within the 1632 series. Flint has pointed out that he thinks in terms of plot threads, not of major protagonists. But most web chatter revolves around geographical "spheres of influence", locations, or where protagonists have a general effect. As a series focused on displaying a believable neohistory given the series beginning—of being as realistic as possible given the initial series premises—the two approaches both fail equally in covering all the cases by any strict measure, because the character set who is starring in one thread will almost invariably appear in one or more other story lines as a personal departure point for that character's personal biographical history, or as a supporting role for events depicted in a book mainly covering events in another thread. "Real history is messy," Flint has written in the foreword to Ring of Fire in explaining why he took the unusual step of opening a universe consisting of a single novel at the time into a shared universe. A former union organizer and a socialist, Flint disdains the Great Man theory of history, where big figures of heroic scope define events, but instead lays claim throughout the entirety of works in the series, that history is the small actions of common men acting in their own self-interest who in the aggregate determine historical forces and force events and responses from those in power, who might lay some claim to being a giant of history—the statesmen and power brokers who dot the Is and cross the Ts and add occasional curlicues to the historic march of events—riding the torrent far more often than leading it in Churchillian or Rooseveltian fashion. That some persons of that mold have existed is not disputed, but that the narrative report that makes up historical reporting tends to overstate their impact and role, is Flint's theme. No matter what approach one takes to classifying a plot sequence in the series—be it geographical or character-based—the key element of the series to comprehend is that the events depicted in its now voluminous works are not taking place in a vacuum, but in most cases are concurrent with developments in other parts of the European center. The Central European thread or more correctly, the Central and Southwest Central European thread, is the main plot thread of the series. It concerns events in the region from west to east of the Kingdom of England and Kingdom of Scotland, Northern France, the Spanish Netherlands, French Netherlands, and the Dutch Republic, and the whole of western Germany eastwards to Brandenburg and the Electorate of Saxony, and southerly to the northern reaches of Bavaria. Bavaria proper, Switzerland, Austria, Bohemia, and points easterly and north are properly geographically part of the Eastern European thread. Anthology: Ring of Fire (January 2004), includes "The Wallenstein Gambit" with Mike Spehar which begins the Eastern Europe thread, "In the Navy" by David Weber, and other stories antedating 1633 in the neohistory. Novel: 1634: The Ram Rebellion (April 2006) with Virginia DeMarce, crafted as a collection of related "key developmental events". This is structured more as an anthology and includes substantial material from Paula Goodlett and other authors, but classed as a novel by the publishing trade since the stories all come together as having a related overall story arc (theme). Novel: 1634: The Baltic War (May 2007) with David Weber, the direct main thread novel sequel to 1633. Novel: 1634: The Bavarian Crisis (October 2007) with Virginia DeMarce, chronological sequel to 1632, but continues the Eastern European thread. The Southern European thread, or Western South Europe and South Central European thread, or perhaps more appropriately, the South-Central and Southwestern European thread, involves characters introduced in the short story "To Dye For" by Mercedes Lackey but the thread plot action proper continued in the second published novel sequel of the series, the best-selling 1634: The Galileo Affair and its direct sequel, 1635: The Cannon Law, both co-written by Flint and Andrew Dennis. The main characters are, in part, Lackey's The Stone Family, combined with Flint's Sharon Nichols and Larry Mazzare. Novel: 1635: The Cannon Law (September 2006), sequel to The Galileo Affair. Novel: 1635: The Papal Stakes (October 2012) with Charles E. Gannon, sequel to The Cannon Law. The Eastern European thread is taken to be east of the East Central European thread, the latter of which may be understood as the baseline through eastern parts of modern-day Germany, Austria, and western Hungary. The first fiction written within this thread was the novelette "The Wallenstein Gambit" and the prequel short stories leading up to it, all published in Ring of Fire, but subsequent long fiction planned in the setting had to await authors' scheduling issues. Novelette: "The Wallenstein Gambit", continues from two plot lines suggested in "Here Comes Santa Claus" and "A Lineman for the Country" in the same anthology. Serialized novel in progress: The Anaconda Project by Eric Flint, directly continues "The Wallenstein Gambit" and follows the establishment of a new empire with its capital at Prague. David Weber and Eric Flint in 2002 (writing 1633 and Ring of Fire) originally contracted together and with Baen's Books to co-write five "main series" books—the first two and perhaps some as yet unrevealed others being known as the naval thread. When working on the long-delayed 1634: The Baltic War novel and with the prolonged and ongoing demand for the series sequels, and considering the already-experienced delays imposed by the difficulty of getting schedules between themselves synchronized (it took three planned "windows of opportunity" before one worked in The Baltic War) well enough for the two to have the three to six months or so needed to collaborate successfully, the two decided to alter their original planning and spin off a new thread—one based on the United States of Europe as a naval power. The thread is continued in 1636: Commander Cantrell in the West Indies, which is the story of the United States of Europe's naval task force, operating in the Caribbean Sea and surrounding waters, and the various forces it comes into contact with (including the surviving remnants of the Dutch naval force destroyed in 1633). This agreement for Weber to leave aside European threads likely will follow up foreshadowings of overt dislike evinced by various Grantville natives for both the African slave trade and the Amerindian encounters with colonizing Europeans—and Flint has already written a very sympathetic, two-volume alternate history from the American Native's viewpoint in his Arkansas Wars series—and he'd written similar foreshadowings into the series' earlier works that were spun into pro-democracy and anti-anti-Semitic social themes now manifesting in the series in the Eastern Europe thread in particular, as well as an overall, muted sub-theme. This revised author's decision released a logjam of backup of other novels in the series, so that since rehashing their arrangement, 1632 series books have been released regularly every 4–6 months. Stories in 1632 Slushpile regarding obtaining strategically important materials and some which have reached publication in regard to the Essen Steel Corporation and Essen Chemical are foreshadowing activities (mining chromium for one) in North America, and others are pursuing latex rubber in South America. In addition, the three books contracted between Flint and David Weber will in part involve expeditions sent by Gustavus and Mike Stearns to American shores. Serialized novel: Stretching Out by Iver P. Cooper, exploration and colonization for rubber in South America. Serialized novel: Northwest Passage by Herbert & William Sakalaucks, French takeover of British North America and Danish colonization of Newfoundland and Hudson Bay. The first full novel in the Americas and Asia thread was published in 2013: 1636: Seas of Fortune (December 2013) by Iver Cooper. Stretching Out: the United States of Europe seeks out oil, rubber and aluminum ore. Pioneers cross the Atlantic and found a new colony in South America. Rising Sun: the changes caused by the Ring of Fire are reaching Japan. The Shogun, impressed by samples of up-time technology and influenced by information about Japan's possible future, decides to end a policy of isolation and change his country's fate forever. Fans are encouraged to contribute to the series though an online message board known as Baen's Bar. The entire Grantville Gazette and large portions of the Ring of Fire anthology, both of which are considered canonical, are paid, fan-written (albeit edited by Flint) works, and have directly contributed material to the main novels. The author also worked with other established authors to develop new stories and plot lines for further novels which are also published in the two Ring of Fire anthologies. 1632 is the first novel in the alternate history 1632 series. It is a science fiction novel originally released in November 2000, but atypically, continues to actually increase in quarterly sales, as do most of the sequels. Originally a single stand-alone story, the novel is now the first of an open-ended series with over twenty-six works of all kinds including e-published only works (e-books) of which twelve are standard trade printed books. Three (of eighteen of the bi-monthly Gazettes, and counting) are the printed canonical Grantville Gazettes (I, II, and III, the first of which is almost entirely longer fiction Flint couldn't put in the already lengthy Ring of Fire shared universe collection, the de facto first sequel antedating collaborative work on 1633, and of which two have been best sellers), published in print, and an additional, rapidly growing number of related Grantville Gazettes e-books or e-zines (not in print). In writing 1632, Flint's web forum Mutter of Demons at Baen's Bar was soon taken over by exploratory posts as captivated readers commented on the E-ARC released book, creating a ground swell of interest ("Internet buzz") in the months before its hardcover release. So strong was the response, especially after the release of the printed work, that a new 1632 Tech Manual sub-forum was created for discussions about it in early 2000, for the discussions had also spilled over into Weber's Bu-ships tech forum, and Weber joined the bandwagon by suggesting a sequel was in order. In the event, the two co-wrote 1633 and collaborated further on integrating the short fiction (much of it unsolicited) into the de facto Ring of Fire sequel. It was followed by two other related forums: 1632 Slush and 1632 Comments, within the next two years. The Grantville Gazettes are a series of short stories in the collaborative fiction experiment, which started life as an online serialized magazine with an inconsistent and sporadic publication history. After the death of Jim Baen and with the publication of Grantville Gazette X by Baen Books, the last under contract with Baen, the Gazettes were again reconstituted as a subscription e-zine, now published regularly at six per year (bi-monthly) and paying above standard rates for submissions. They are a "boiler room" powering the collaborative synergy by the people involved with the 1632 Tech Manual and have developed into a repository for new ideas and themes in the series, although most explore the personal experiences of minor characters in the series or examine in depth some aspect (e.g. a multi-part serial explores and details Grantville's impact on public health in general, and the establishment of twin teaching hospitals as a joint project of the University of Jena and Grantville's new hospital, the Lahey Clinic). In general, the anthologies in the series depict deep background canonical to future tales, but which are not in the mainstream "action" of the novels focus. A group of stories have on several occasions produced a new plot thread. As of the end of 2012, there are now 42 volumes of the Grantville Gazettes, most of them available in Amazon Kindle editions as well as some other electronic formats. The Gazettes began as an experimental, semi-professional, online magazine featuring fan fiction and nonfiction edited by Flint and (eventually) a volunteer editorial board. At the time of Jim Baen's death in the summer of 2006 ten Grantville Gazettes were under contract and they had (with some fits and starts) settled into a new version roughly and irregularly three times a year. Baen's production staff was somewhat overworked by the deadline and the serialized magazine gave way to an e-book release from the sixth volume onward—though this was explained by Flint as primarily being due to Flint's other commitments, such as editing the new science fiction magazine Jim Baen's Universe. Earlier on, he'd explained the production delays in terms of overworked proofreaders, executive editors, and so forth. Issues VI through X, after being released as e-books, seem unlikely to see print; whereas Jim Baen has been releasing (all but the first) issues some months later as hardcover books, the last he bought has yet to appear. Flint has explained that the market for anthologies is always very soft, no matter the genre, and it seems likely that any new print version from the Gazettes will be a Best of The Grantville Gazettes. In the meanwhile, Grantville Gazette X was jointly published as an e-book by Baen, but also as the first foray of Eric Flint Enterprises at grantvillegazette.com, which looks to be a joint venture of Baen Books and Flint, where the new incarnation of the e-zine also pays SFWA rates and maintains a bi-monthly (six per year) publishing schedule. It is modeled very much on the same lines as Jim Baen's Universe, which is edited by Flint. Beginning in early 2007, the Gazette's publishers added an online, web-based edition published quarterly and moved the paper series to an annual "best of" volume. Additionally, the publishers moved to paying full professional rates instead of the semi-pro rates that had been paid. The Gazette is an SFWA-qualifying market. When the novel 1632 was written in 1999, it was conceived as an experiment in the literary genre alternate history by Flint, without intentions of writing any immediate sequel. He had, in fact, several other years of writing projects planned, which subsequent developments were to delay as late as publication in 2006–2007. Flint—as a relatively new writer at the time, following the popular demand for a sequel, elected to invite other established authors in the Baen's stable of writers to share the universe in order to rapidly develop its potential—in this he traded on his experience as an editor. This went on concurrently with a great deal of reader input in what became the 1632 Tech sub-forum on Baen's Bar. In this initiative, he became the editor (he was already a Baen editor for the Baen Free Library) and together with fan input on Baen's Bar, and collaboration with established best-selling author David Weber on the first long sequel, 1633, concurrently put together the Ring of Fire anthology to inaugurate the short fiction in the series. The novel and anthology shaped one another, all filtered through and also shaped by the discussions on Baen's website. This process continues to this day, primarily in the form of The Grantville Gazettes. Initially an experimental e-magazine of fan fiction, the first volume was successful enough to be released as a paperback. Subsequent Gazettes have also been released in print form. Flint, as editor of all the short fiction, also maintains the series canon (co-ordinated by the 1632.org website) and all copyrights to the alternate history universe per se, and with Flint as the controlling editor, the consequence is, semi-pro or professional payment rates aside, Baen doesn't publish anything in the series which is not canonical. In point of fact, the short fiction in the series frequently provides a more in-depth background and foreshadows larger events that are the meat of the long fiction in the series. The longer works are replete with mentions to events covered in the shorter works, and with characters and the history and events unfolded in such materials. Flint always publishes one of his own stories within the short fiction collections, or in the case of 1634: The Ram Rebellion, considerably more, as it introduces several important background factors that are central to further series developments as the altered history is to unfold to the reader. In January 2018, the Ring of Fire Press expanded their list of available publications by releasing their first original novel in the 1632 series, 1635: The Battle for Newfoundland, which only contained original material that was not previously published. In addition to Amazon, Baen began distributing selected titles for Ring of Fire Press through their web store and their other distribution channels. Essen Steel June 2013 Kim Mackey 978-1-4905-3062-8 Originally published as a serial in 3 parts in Gazette volumes 7–9 as The Essen Chronicles. The Danish Scheme June 2013 Herbert Sakalaucks and Eric Flint 978-1-4905-0290-8 Originally published as a serial in 9 parts in Gazette volumes 22, 23, 28–31, and 33–35 as Northwest Passage. Heavily rewritten and includes new material by Herbert Sakalaucks plus a new short story by Eric Flint. Joseph Hanauer June 2013 Douglas W. Jones 978-1-4905-3057-4 Originally published as a serial in 3 parts in Gazette volumes 8, 13, and 14. No Ship for Tranquebar June 2013 Kevin H. Evans and Karen C. Evans 978-1-4905-0290-8 Originally published as a serial in 4 parts in Gazette volumes 27–30. Turn Your Radio On June 2013 Wood Hughs 978-1-6257-9453-6 Originally published as a serial in 6 parts in Gazette volumes 19–24. Second Chance Bird June 2013 Garret W. Vance 978-1-6257-9454-3 Originally published as a serial in 13 parts in Gazette volumes 32–41, and 43–45. Minor re-write from serial version. Medicine and Disease after the Ring of Fire June 2013 Vincent Coljee, Kim Mackey, Gus Kiritikos, Brad Banner, and Iver Cooper A collection of 8 separate non-fiction articles originally published in Gazette volumes 10, 26, 29, 34, 35, and 38. Bartley's Man August 2016 Paula Goodlett and Gorg Huff 978-1-5370-5233-5 Originally published as a serial in 3 parts in Gazette volumes 46–48. Re-written with new material added. The Muse of Music January 2017 Enrico Toro and David Carrico 978-1-5399-2322-0 Originally published as 7 related stories in Gazette volumes 2, 3, 5, 13, 31, 44, 45, and 46 under various titles. Includes 2 non-fiction articles. Love and Chemistry February 2017 Jack Carroll and Edith Wild 978-1-5428-0115-7 Originally published as a serial in 6 parts in Gazette volumes 49–54 as The Undergraduate. Re-written with new material added. 1635: The Battle for Newfoundland January 2018 Herbert Sakalaucks 978-1-6257-9657-8 Sequel to The Danish Scheme. New material. First novel published by the press from unpublished material. Essen Defiant March 2018 Kim Mackey and David Carrico 978-1-9804-8249-9 Sequel to Mackey's Essen Steel. New material that has never been previously published. This book also help set up the events that led to the beginning to Pedersen's book 1635: The Wars for the Rhine that was first published in 2016. The Monster Society April 2018 Eric S. Brown, Robert E. Waters and Anna G. Carpenter 978-1-9808-6473-8 Originally published as a serial in 8 parts in Gazette volumes 61–71 plus one original installment with a promise that the storyline introduced in the new story would be continued in the Gazette. Letters From Gronow May 2018 David Carrico 978-1-9829-7896-9 Originally published as a serial in 6 parts in Gazette volumes 70–75. Includes new material that continues the story. The Persistence of Dreams May 2018 Meriah L. Crawford and Robert E. Waters 978-1-9829-5233-4 Originally published as a series of semi-related short stories about painter Daniel Block in Gazette volumes 46, 50, 60, 61, 62, and 67. The short story The Winter Canvas: A Daniel Block Story was awarded the Gazette's Best of 2016 Award. Includes minor changes. The Hunt for The Red Cardinal June 2018 Bradley H. Sinor and Susan P. Sinor 978-1948818056 Includes a new novel that is an expansion of their D'Artagnan short stories that were published in Gazette volumes 10 and 41, and Ring of Fire III, which are also included. The Chrysanthemum, the Cross, and the Dragon August 2018 Iver P. Cooper 978-1948818117 New novel containing original unpublished material about the invasion of the Spanish Philippines by the Dutch and Japanese, an event that was briefly hinted at in Cooper's previous work 1636: Seas of Fortune, and also about the peaceful transfer of Spanish Formosa (northern Taiwan) to Zheng Zhilong, a private merchant and an admiral in the Ming navy, approximately 30 years ahead of schedule. In October 2018, the Ring of Fire Press began releasing novels that are part of the Time Spike series that were previously published as serials in the Grantville Gazette. Time Spike: The Mysterious Mesa October 2018 Garrett W. Vance 978-1948818179 Originally published as a serial in 17 parts in Gazette volumes 39–79 that is set in the Cretaceous Period of Time Spike in which the protagonists include a citizen of the newly formed Republic of Texas serving as a soldier in the US Army Cavalry who was escorting the Cherokee during the Trail of Tears incident, a Spaniard serving in Hernando de Soto's 16th century expedition across the Southern United States, and several Pre-Columbian Native Americans from several different time periods ranging from the Neolithic to the Mississippian culture period. In April 2017, the Ring of Fire Press began releasing novels that were not a part of either the 1632 or Assiti Shards book series. Incident in Alaska Prefecture April 2017 Stoney Compton 978-1-5450-8977-4 A novel set in Japanese-occupied Alaska 22 years after the Axis powers had won World War II. The Demons of Paris March 2018 Eric Flint, Gorg Huff, and Paula Goodlett 978-1-9803-4414-8 The first book in a new series involving 21st century high school students in a van, 14th century Paris, and demons taking control of mechanical and electronic devices. Pandora's Crew June 2018 Gorg Huff and Paula Goodlett 978-1983099175 Space opera novel; first book of the StarWings series. Emergence June 2018 David R. Palmer 978-1948818063 Reprint of award winning novel that was first published in 1984. The Masks of Mirada July 2018 Robert E. Waters 978-1948818094 Sword and magic novel; first book of the Mask Cycle series. Demons of the Past: Revolution October 2018 Ryk E. Spoor 978-1948818131 Second book in his Demons of the Past series. Perdition October 2018 Marella Sands 978-1948818155 Alternate history in which the Confederate States of America survived as a separate nation for almost 1.5 centuries with a co-existence and a fragile peace with the Union. Threshold November 2018 David R. Palmer 978-1948818193 Reprint of a novel that was first published in 1985. Big Stick November 2018 Michael A. Ventrella 978-1948818216 A steampunk alternate history that involves Teddy Roosevelt and a number of other notables at the end of the nineteenth century. WarSpell: The Merge December 2018 Gorg Huff and Paula Goodlett 978-1948818230 RGP players suddenly gained magical powers and received the "memories" of the characters that had played. Demons of the Past: Retribution March 2019 Ryk E. Spoor 978-1948818278 Third and final book in his Demons of the Past series. Legend March 2019 Ryk E. Spoor 978-1948818292 Psychotic Super heroes. Lost Signals March 2019 Charles E. Gannon (editor) 978-1948818247 An anthology containing short stories from different authors that are set in the universe of Gannon's Terran Republic series. Death Lives in the Water April 2019 Shoshana Edwards 978-1948818315 Supernatural rural police mystery. Ganny Knits a Spaceship April 2019 David Gerrold 978-1948818339 A space opera from an established SF author and screenwriter who has written episodes of the orignal Star Trek series. Based upon a 2009 short story of the same name that was first published in Jim Baen's Universe. As of 2014, four books in the series had significantly large number of sales of hardcover editions to become eligible for The New York Times Best Seller list. 1634: The Galileo Affair was on the best seller list for hardcover fiction for two weeks during April 2004 while reaching number 27. 1634: The Baltic War was on the same list for two weeks during May 2007, peaking at number 19. 1634: The Bavarian Crisis was on this list for a week in October 2007 at number 29. The most recent book, 1636: The Kremlin Games was on the NY Times list for a week during June 2012 at number 30. Almost all of the books in the series sold well enough to get listed on the various Locus Magazine Bestsellers Lists with some titles listed multiple times, and a few even reached the top spot for the month. 1635: The Papal Stakes is the first book in the series to get listed on the Wall Street Journal Best-Selling Books list. ^ Flint, Eric (March 2006). "forward and afterwords". In Eric Flint (ed.). Grantville Gazette II. 1632 (1st, Hardcover ed.). afterword: Baen Books. p. 324. ISBN 978-1-4165-2051-1. pp316-317 beginning with "Which is the way I intended things, from the moment I decided to turn 1632 from a stand-alone novel it was originally written to be into a series." ... through "where revolutions have typically been depicted as the product of magical hand waving by a handful of big-shot heros. They decree, and therefore it is done." ^ "Publishing Schedule". Baen Books. Archived from the original on 28 November 1999. Retrieved 29 April 2017. ^ "Publishing Schedule". Baen Books. Archived from the original on 2 August 2002. Retrieved 29 April 2017. ^ a b "Publishing Schedule". Baen Books. Archived from the original on 2 February 2004. Retrieved 29 April 2017. ^ a b "Publishing Schedule". Baen Books. Archived from the original on 6 August 2006. Retrieved 29 April 2017. ^ a b c d e "Publishing Schedule". Baen Books. Archived from the original on 28 August 2008. Retrieved 29 April 2017. ^ "Publishing Schedule". Baen Books. Archived from the original on 22 July 2010. Retrieved 29 April 2017. ^ a b "Publishing Schedule". Baen Books. Archived from the original on 15 April 2011. Retrieved 29 April 2017. ^ a b "Publishing Schedule". Baen Books. Archived from the original on 30 June 2012. Retrieved 29 April 2017. ^ a b "Publishing Schedule". Baen Books. Archived from the original on 30 October 2013. Retrieved 29 April 2017. ^ a b "Publishing Schedule". Baen Books. Archived from the original on 25 June 2014. Retrieved 29 April 2017. ^ a b "Publishing Schedule". Baen Books. Archived from the original on 9 May 2015. Retrieved 9 May 2015. ^ a b Eric Flint (10 November 2014). "Eric Flint Newsletter – 7 NOVEMBER 2014". Eric Flint. ^ a b c "Publishing Schedule". Baen Books. Archived from the original on 25 June 2016. Retrieved 25 June 2016. ^ "Weber Forums • View topic - A New World Rebellion". Archived from the original on 12 January 2014. Retrieved 12 January 2014. ^ a b "Publishing Schedule". Baen Books. Archived from the original on 15 September 2016. Retrieved 18 September 2016. ^ "Publishing Schedule". Baen Books. Archived from the original on 17 July 2017. Retrieved 17 July 2017. ^ "1637: The Volga Rules (publisher information)". Simon & Schuster. Retrieved 31 August 2017. ^ "Events & Publishing Calendar". Baen Books. Archived from the original on 25 September 2018. Retrieved 25 September 2018. ^ "Publishing Schedule". Baen Books. Archived from the original on 28 June 2009. Retrieved 29 April 2017. ^ "Publishing Schedule". Baen Books. Archived from the original on 26 September 2015. Retrieved 26 September 2015. ^ a b Flint, Eric (December 2009). "Aftwerword". In DeMarce, Virginia (ed.). 1635: The Tangled Web. Baen Books. ^ Flint, Eric. Grantville Gazette II. Baen Books, 2005, Afterword. ^ "About Us". Eric Flint's Ring of Fire Press. ^ R Boatright, "Ring of Fire Press - Formal Announcement", posted 19 June 2013 to the 1632 Tech forum on Baen's Bar, bar.baen.com; search for "Ring of Fire Press" on www.amazon.com. ^ "Ring of Fire Press - Publishers". Baen Books. ^ Hasseler, Bjorn (1 November 2017). "Best of 2017 Award". Grantville Gazette. Vol. 74. ^ "The Chrysanthemum, the Cross, and the Dragon by Iver P. Cooper - Ring of Fire Press". Baen Books. ^ "Incident in Alaska Prefecture by Stoney Compton - Ring of Fire Press". Baen Books. ^ Flint, Eric; Huff, Gorg & Goodlett, Paula (1 March 2018). "The Problem With Demons". Grantville Gazette. 76. ^ Gerrold, David (August 2009). Baen, Jim (ed.). "Ganny Knits a Spaceship". Jim Baen's Universe. Vol. 4 no. 2. Baen Books. ^ "Hardcover Fiction". The New York Times. 18 April 2004. Archived from the original on 10 April 2014. Retrieved 18 February 2017. ^ "Hardcover Fiction". The New York Times. 25 April 2004. Archived from the original on 10 April 2014. Retrieved 18 February 2017. ^ "Hardcover Fiction". The New York Times. 13 May 2007. Archived from the original on 10 April 2014. Retrieved 18 February 2017. ^ "Hardcover Fiction". The New York Times. 20 May 2007. Archived from the original on 10 April 2014. Retrieved 18 February 2017. ^ "Hardcover Fiction". The New York Times. 21 October 2007. Archived from the original on 2 April 2014. ^ "Hardcover Fiction". The New York Times. 24 June 2012. Archived from the original on 5 April 2014. ^ "Locus Bestsellers, July 2004". Locus Magazine. July 2004. ^ "Locus Bestsellers, November 2005". Locus Magazine. November 2005. ^ "Locus Bestsellers, December 2005". Locus Magazine. December 2005.